Yeb Sano following his pledge to fast until a meaningful action were reached. Photo credit 350 via flickr. The COP 19 conference had hardly started before Filipino negotiator Yeb Sano made a statement that would make world headlines, and very well could be remembered as the headline of the two-week-long climate summit. Sano was delivering an emotional plea in the wake of the very recent catastrophical typhoon Haiyan, which so far is estimated to have killed 10,000 in the Philippines and is the worst tropical storm that the Pacific country has ever witnessed. “In an arrangement with the Philippines delegation to demonstrate their solidarity with those impacted by this climate disaster, civil society were to accompany Mr. Sano from the plenary hall to a side-event. UN-security were informed of the gesture some minutes prior to the action and a green light was given. 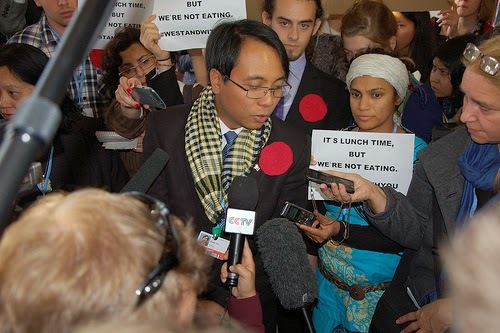 Despite authorisation, the three young people accompanying Mr. Sano, who unfolded a sign with the names of some of the devastated Filipino towns in a gesture of solidarity, were reprimanded by security and ejected from the UN halls’’. Further to this, the coalition said that the activists were thrown out on the orders from Christiana Figueres, the UN climate chief and that they were being banned indefinitely from the negotiations. Following the dismissal from the climate talks, Maruska Mileta from Young Friends of the Earth Europe said: “We find the decision from the UN climate chief, Christiana Figueres, unprecedented and exaggerated. This is a decision that needs to be undone’’. In relation, news prior to the start of COP 19 YOUNGO had been critical of Figueres decision to attend a coal summit in the same week as the last week of the talks. They presented her with an ultimatum in either: she supports the coal industry, or she supports the young people who are fighting for an alternative future: “We are calling on Ms. Figueres to pick and stick. Pick the future over the past. Pick clean energy over dirty fossil fuels. Pick and stick with young people all over the world who are fighting for a better future,” said Lucy Patterson, a coordinator for campaigning network Push Europe. And in surprising developments he turned personal and said he would start a voluntary fast and not eat until a meaningful outcome has been reached.